It’s true that brunch is a popular weekend (or weekday) tradition in our city, and there are plenty of options when it comes down to who serves it best. From traditional hearty plates such as eggs-and-bacon, to Southern-inspired dishes like chicken-and-waffles, all the way to contemporary multi-course brunch menus with cocktail pairings, Vancouver definitely has something to offer for each type of palate. So whether you enjoy waking up in the morning or not, consider thinking about which spot to check out for your post-breakfast-pre-lunch meal—it’ll be worth it. 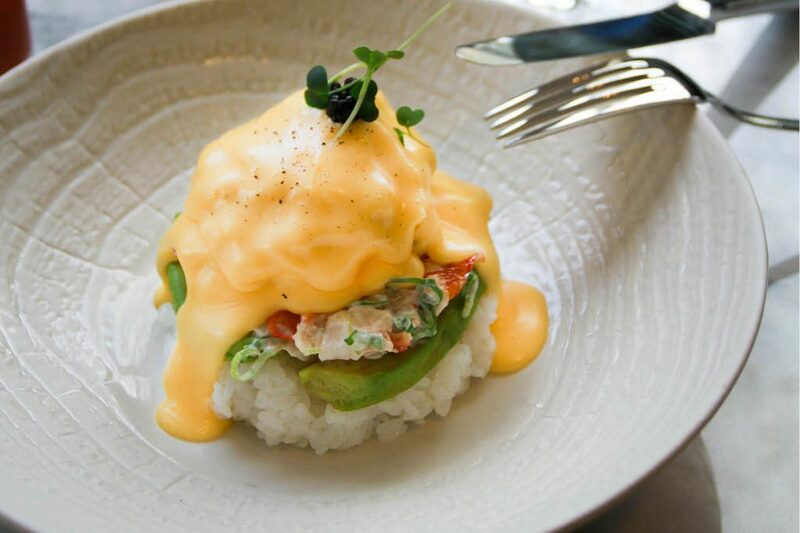 For a luxurious brunch, try its new five-course cocktail brunch with a Japanese twist. The menu starts off with your choice of red tuna tataki or torched wagyu beef salad, before proceeding to heavier dishes such as wild salmon motoyaki “benny” and sushi omakase. Finish off with a yakult shooter in an oyster shell, and a delicate plum gelée. Guests can choose to make it a boozy brunch and pair each course with a unique cocktail for an extra charge—think bloody marys and sparkling Junmai sakes. This brunch menu is available on weekends (accompanied by live music) from from 11 a.m. to 2 p.m.